3. Department of Obstetrics and Gynecology, Navy General Hospital, Fucheng Road, Beijing, PR China. Keywords: Hydrogen, free radical, radiation, radioprotection. Great benefits for people have been got because of extensive utilization of atom energy in many fields such as medicine, civil industry, agriculture, military etc. In the meantime, how to protect human health and safety from severe nuclear radiation was always a critical problem in the world . It is a novel scientific topic for radiologists to look for high-effective radiation protectants with low toxicity. In fact, exploitation the ideal radiation protectants has always been emphasized in the field of radiation [2, 3]. However, it is always an obstacle. As we know, damaging effects of radiation are divided into direct effect and indirect effect, which accounts for about most of the damages . Since the indirect effect mainly due to the abundant free radicals caused from radiation, so blocking and scavenging of free radicals become our most important protecting strategy. In 2007, Ohsawa et al. found that molecular hydrogen could selectively reduce cytotoxic reactive oxygen species in vitro and exert therapeutic antioxidant activity. From then on, research on hydrogen set off a worldwide upsurge [6-10]. Hydrogen could selectively reduce hydroxyl radicals excited our interest, because most of irradiation induced injury was caused by hydroxyl radicals. Therefore, we firstly reasoned and demonstrated that hydrogen might have great radioprotective effects in 2010[11, 12]. Since then, application of hydrogen on radioprotection was well investigated [13-17]. It was also then used in clinic to improve the quality of life of patients treated with radiotherapy for liver tumours . The objective of this review was to offer an overview of major scientific and clinical advances of hydrogen as a new class of radioprotective agent. The detrimental biological effects of radiation are divided into direct effect and indirect effect. In physics, radiation is a process in which energetic particles travel through a medium or space. Direct detrimental biological effect of radiation is caused by radiation energy in the exposure pathway, which targets molecules including DNA, proteins and lipids, et al . Direct effect could be prevented by radiation shielding materials. However, indirect detrimental biological effect of radiation is caused by free radicals generated from radiolysis of H2O (Figure 1). Among those free radicals generated from radiolysis of H2O, hydroxyl radical is the most reactive product. Detrimental effects of IR on biological tissues are, in major part, mediated via increased production of hydroxyl radicals. It was estimated that 60-70% of the IR-induced cellular damage was caused by hydroxyl radicals . 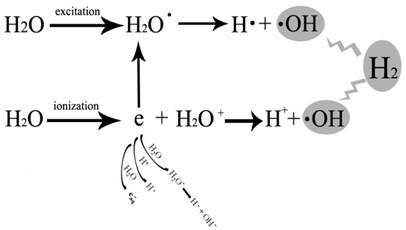 Hydroxyl radicals produced during radiolysis of water can trigger oxidation of DNA, lipids, amino acids, saccharides etc leading to formation of various secondary free radicals. These free radicals can produce severe health impairments due to injury and failure to susceptible cells and organs[19, 20]. DNA is one of the major targets of free radicals and 8-OHdG is formed from deoxyguanosine in DNA by hydroxyl radicals , which is also a biomarker of carcinogenesis . Membrane lipids are also one of the major targets of free radicals . Lipid peroxidation products including malondialdehyde, TBARs, etc are the indices of lipid damage , leading to changes in membrane permeability [25, 26]. Structure of proteins could also be changed by hydroxyl radical and other free radicals, which induced the change in the function of proteins . Free radicals generated during radiolysis of water and cytotoxic oxygen radicals that hydrogen could selectively reduce. Initial radiation chemistry of ionization and excitation is to generate H2O+ and e- from the ionization of H2O, and hydrogen atom (H∙) and hydroxyl radical (∙OH) from the excited H2O. ∙OH is the cytotoxic oxygen radical that hydrogen could selectively reduce which caused most of the IR-induced cellular damage. Hydrogen is the lightest and most abundant chemical element. Molecular hydrogen is a colorless, odorless, nonmetallic, tasteless, highly flammable diatomic gas which was firstly documented by Philippus Aureolus Paracelsus in 1520 as a kind of flammable gas . It was named by Lavoisier in 1783 by a french word” hydrogene” . However, hydrogen was extensively used in aeronautical nature such as hydrogen balloon and in chemical field such as fuel processing, fertilizer production ((3H2 + N2 → 2NH3), etc since 1783 while it was seldom used in medicine. Early in 1888, Pilcher JE et al. reported one of the very publications linking hydrogen and medicine. They reported that hydrogen gas was insufflated the gastro-intestinal canal to locate visceral injuries, avoiding unwarranted surgeries . This paper is probably the first document linking hydrogen and medicine. Until 1975, Dole et al. reported that hyperbaric hydrogen may be a possible treatment for cancer. They found a marked regression of the skin squamous cell carcinoma by inhalation of a mixture (2.5% O 2 and 97.5% H 2) at a total of 0.8 MPa for 2 weeks in a mouse model. They tried to elucidate the phenomenon with the possibility of H2 as a free radical decay catalyser. In 1988, H2 was demonstrated reducing hydroxyl radicals produced by radiolysis or photolysis of H2O in cell free systems by Buxton et al . In 2001, Gharib B et al. reported that H2 attenuated schistosomiasis-associated chronic liver inflammation in mice . However, these investigations did not draw attention from researchers. Until 2007, Ohsawa et al. discovered that hydrogen gas has antioxidant and antiapoptotic properties that protect the brain against ischemia-reperfusion injury and stroke by selectively neutralizing hydroxyl and peroxynitrite radicals. This study was well designed and took hydrogen gas into a new era. It has been demonstrated that H2 exerted preventive or therapeutic effects on cerebral, myocardial, hepatic ischemia-reperfusion injuries, intestinal transplantation, lung transplantation, renal transplantation, heart transplantation, acute graft-versus-host disease post allogeneic hematopoietic stem cell transplantation, etc [33, 34]. Recent basic and clinical research revealed that hydrogen is an important physiological regulatory factor with antioxidant, anti-inflammatory and anti-apoptotic protective effects on cells and organs [35-40]. Hydrogen was also demonstrated has radioprotective effects on cultured cells and mice [11-16, 41] (Figure 2). H2 exert antioxidative effects with few toxic side effects. Saitoh et al. detected mutagenicity, genotoxicity and subchronic oral toxicity of hydrogen in a rat model . In the model they observed significant changes of basophil ratio of blood in female rats and decreased aspartate aminotransferase and alanine aminotransferase in male rats. However, these changes were not considered biologically significant. In another study on human beings, Nakao A et al. also observed similar clinical chemistry parameters . 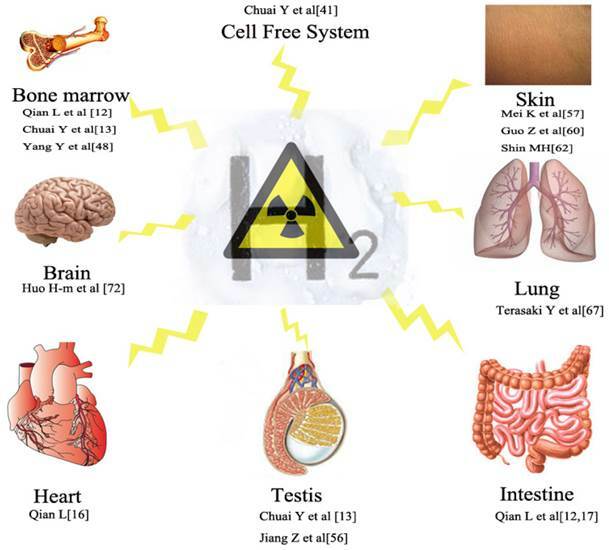 Radioprotective effects of hydrogen on different systems including cell free system, intestine, haematopoietic system, testis, skin, Lung, cardiovascular, brain, etc. In cell free systems, our group produced ∙OH by radiolysis of H2O and Fenton reaction . In the study, we found that 71.2% of ·OH in the Fenton reaction was reduced by H2 dissolved in phosphate buffer (10 mM) solution at 23 ℃ and pH 7.4 under 0.4 MPa for 2 hour, while 88.7% of ·OH was reduced in radiolysis of H2O by 5 Gy 60Co γ -ray. When H2 was replaced with nitrogen (N2), the levels of ·OH did show significant change. The gastrointestinal tract is one of the most susceptible organs to radiation . As low as 1 Gy of radiation induces dramatic increase in apoptosis in mouse small intestinal crypt within three to six hours after exposure, predominantly in the stem cell region  . To study the radioprotective effects of H2 on intestine, we chose Human intestinal crypt HIEC cells to study which was sensitive to irradiation [12, 17]. In the study, cells were treated with or without different concentrations (0.1-0.4 mmol/L) of H2 before exposed to different doses ofγ-radiation (up to 8 Gy). We demonstrated that treating cells with hydrogen before irradiation could significantly inhibit IR-induced cell apoptosis, increase viability of Human intestinal crypt HIEC cells. In 2010, our group also demonstrated that intraperitoneal injection of hydrogen-rich saline before radiation in a mouse model protected the gastrointestinal endothelia from radiation-induced injury, decreased plasma MDA and intestinal 8-hydroxydeoxyguanosine levels and protected plasma levels of endogenous antioxidant enzymes including superoxide dismutase and glutathione-S-transferase . The haematopoietic system has a high level of cells turnover which is also one of the most sensitive system to IR . Myelosuppression is a critical issue for individuals exposed to IR which always treated by hematopoietic transplantation but with low efficacy [46, 47].The primary cause of radiation death in sublethal dose range is due to sepsis, resulting from low numbers in bone marrow cells and leukocytes of peripheral blood. To study the radioprotective effects of H2 on haematopoietic system, we chose Human Lymphocyte AHH-1 cells to study which were sensitive to irradiation . In the study, cells were treated with or without different concentrations (0.1-0.4 mmol/L) of H2 before exposed to different doses of γ-radiation (up to 8 Gy). We demonstrated that treating cells with hydrogen before irradiation could significantly inhibit IR-induced cell apoptosis, increase viability of Human Lymphocyte AHH-1 cells. Endogenous antioxidants (superoxide, glutathione) were protected by hydrogen, while malondialdehyde and 8-hydroxydeoxyguanosine concentrations of Human Lymphocyte AHH-1 cells were decreased. Those results showed that the protective effects of hydrogen had positive correlation with the concentrations of hydrogen. However, if we treated cells after radiation, the therapeutic effects of H2 was not significant . In a study by Chuai Y et al, hydrogen-rich saline prior to IR increased bone marrow nucleated cells (BMNCs) and leukocyte counts in irradiated mice compared with those without hydrogen. In the study, Hydrogen -rich saline prior to IR also increased the levels of spleen weights, endogenous haematopoietic spleen colony formations (endoCFUs) . In another study by Yang Y et al., they demonstrated H2 reduced ROS level in Human lymphocyte AHH-1 cells as well as in the radiolysis of water induced by 12C6+ heavy ion radiation. They also showed H2 attenuated cell apoptosis and inhibited Caspase 3 activation induced by 12C6+ heavy ion radiation-induced. Testis is an important organ of the male reproductive system, which is especially sensitive to ionizing radiation (IR) because of the presence of rapidly proliferating cells (spermatogonia). Doses as low as 0.1 Gy are known to cause damage to spermatogonia [41, 49]. Biochemical and morphological injury can be caused by irradiation in testicular tissue[50-53].Only 2% of men who received total-body IR are able to father children later in life. In 2012, Chuai Y et al. reported the radioprotective effect of H2 on male germ cells by ameliorating apoptotic cells in testicular tissue, and by preserving viability of stem spermatogonia, daily sperm production and sperm quality. In the study, WR-2721 was used as a reference compound, which is the only radioprotectant approved by FDA . Inspiringly, although the radioprotective effects of H2 have been shown to be less than WR-2721, the exceeded protective effect of WR-2721 seems not to be prominent. In accordance with these results, in later papers by Chuai Y et al and by Jiang Z et al, they also demonstrated the radioprotective effects of hydrogen on testis [13, 56] by protecting seminiferous epithelium, preserving testis weight, testis dimensions, sperm count, sperm motility from IR. However, in the paper by Jiang Z et al, it was found that the radioprotective effect of hydrogen on testis is similar to WR-2721 at one time point (after a 4-day initiation of irradiation) which is better than the results by our group. Skin is a biological defense barrier of human body. Radiation injuries skin directly by radiation energy or indirectly by free radicals, causing radiodermatitis which occurred in nearly 95% of patients receiving radiation therapy . There are generally two types of radiodermatitis: acute radiodermatitis(usually occur within 90 days), chronic radiodermatitis (may occurred over a prolonged period) which often exhibited by the onset of erythema, swelling, blisters, and ulceration, followed by development of chronic inflammation, necrosis, fibrosis, and lymphedema[58, 59]. In 2012, Guo Z et al. firstly reported that hydrogen-rich saline protected against UVB radiation injury, possibly by reducing inflammation and oxidative stress. They demonstrated that hydrogen-rich saline had protective effects by altering the levels of markers including necrosis factor alpha, interleukin (IL)-1β, IL-6, tissue superoxide dismutase, malondialdehyde and nitric oxide activity and relieved morphological skin injury against UVB radiation injury on C57BL/6 rats. In 2013, Mei K et al. reported the protective effects of hydrogen on skin in vitro and vitro against γ ray. In the study, our group found hydrogen significantly reduced the severity of dermatitis caused by radiation, accelerated tissue recovery, and reduced the extent of radiation-induced weight loss in rats after a single dose of 15 or 20 Gy radiation. We also found hydrogen protected rats from cumulative doses of 30 Gy delivered in three fractions. In the study, hydrogen also protected Immortalized human keratinocytes (HaCaT cells) from radiation-induced injury. In 2013, Rosa Mistica Ignacio et al. demonstrated the protective effect of hydrogen reduced water (HRW) on UVB-mediated skin injury in hairless mice by balneotherapy. In their study, bathing with HRW significantly reduced the levels of skin damage by decreasing the level of inflammatory cytokines including IL-1β, IL-6, TNF-α and IFN-γ, as well as increased activity of glutathione peroxidase. In their study, HRW bathing also protect UV-induced corneocytes damage and ultrastructural changes. Interestingly, in a recent study by Mi Hee Shin et al., they observed that H(H2O) (atomic hydrogen surrounded by water molecules) application to human skin prevented UV-induced erythema and DNA damage. In their stuy, H(H2O) significantly prevented UV-induced MMP-1, COX-2, IL-6 and IL-1β mRNA expressions in human skin in vivo. They also found that H(H2O) prevented UV-induced ROS generation and inhibited UV-induced MMP-1, COX-2 and IL-6 expressions, and UV-induced JNK and c-Jun phosphorylation in HaCaT cells. The lung is one of the organs most susceptible to radiation injury . Radiation pneumonitis is an inflammation of the lungs that occurs when lung or whole body was irradiated. Development of interstitial pneumonitis increases according to radiation dose, especially single-fraction total body irradiation at higher dose rates  and higher total lung doses [65, 66]. In 2011, our group hypothesized that hydrogen may be a possible prevention strategy of radiation pneumonitis . In 2011, Terasaki et al. showed that H2 reduced irradiation-induced ·OH levels in human lung epithelial cell line A549 cells. They demonstrated that pretreatment of H2 could reduce the fluorescence intensity of hydroxyphenyl fluorescein in irradiated A549 cells. They demonstrated pretreatment of H2 reduced the products of oxidative stress including 4-hydroxy-2-nonenal, 8-hydroxydeoxyguanosine, etc. H2 also could significantly reduce levels of apoptosis-associated proteins including Bax and active caspase 3 in irradiated A549 cells after a 24h incubation with H2-rich solution. In vivo, they demonstrated that H2 treatment reduced oxidative stress and apoptosis, measures of acute damage in the lungs of mice within 1 week after whole thorax irradiation by immunohistochemistry and immunoblotting. In their study, H2 treatment reduced lung fibrosis by chest computed tomography, Ashcroft scores, and type III collagen deposition at 5 months after irradiation. Irradiation of the heart can cause chronic impairment of cardiac pump function and cardiac disease . The most significant type of radiation-induced heart disease (RIHD) appears to be that of myocardial damage, which may result from loss of alkaline phosphatase activity of capillary endothelial cells 6-10 weeks after irradiation [69, 70]. In addition to myocardial degeneration, perivascular and interstitial fibrosis are seen . Injury of heart by irradiation has been shown to be caused by the hydroxyl radical. Intervention to protect the heart from the damage of the hydroxyl radical by hydrogen has been proposed, suggested, and performed by our group. We investigated the cardioprotective properties of hydrogen by pretreating mice with hydrogen rich water prior to irradiation. The results were pleasing in the study, 90% of the mice without hydrogen rich water pretreatment died, while 80% of the mice with hydrogen treatment lived after 30 days post-radiation. When focusing on the myocardium, hydrogen pre-treatment proved to have cardioprotective properties by decreasing melanodialdehyde (MDA) and eight-hydroxydeoxyguanosine (8-OHdG) levels as opposed to the non-treatment counterparts, which showed increased levels of those oxidative stress markers . In a study by Huo H. et al. in Chinese , hydrogen was demonstrated alleviating oxidative stress and early-phase radiation-induced brain injury. They found that the brain water content and the contents of 8-OHdG in the hydrogen group were lower than the control group at 7th day and 14th day post irradiation. The contents of SOD were significantly higher in the hydrogen group from 1st to 7th day post irradiation, while the contents of MDA were significantly lower in the hydrogen group from 1st to 14th day post irradiation. They also found the damage degree in the nerve cells of hippocampus was less in the hydrogen group. Ionizing radiation (IR) is also a well-known carcinogen for various human tissues and a complete carcinogen that is able to both initiate and promote tumor progression [73-75]. A study by Zhao L. et al. found that molecular hydrogen protects mice from radiation induced thymic lymphoma in BALB/c mice . They found that radiation-induced thymic lymphoma rate in the hydrogen group was significantly lower than in the control group and hydrogen treatment significantly prolonged the latency of lymphoma development after the split dose irradiation by reducing ROS, which has been found to be a factor of inducing cancers. Although a remarkable progress about the application of hydrogen as a radioprotectant has been made in past 6 years, there were only a few clinical data. Ki-Mun Kang et al. performed a randomised, placebo-controlled study on 49 patients receiving radiotherapy for malignant liver tumour. Hydrogen-rich water was produced by metallic magnesium (Mg) [Mg + 2H 2 O = Mg (OH)2+ H2 ], and the final concentration of H2 reached to 0.55-0.65 mM. Results showed that daily consumption of hydrogen-rich water for 6 weeks reduced reactive oxygen metabolites in the blood and maintained blood oxidation potential of these patients. Quality of life (QOL) scored during radiotherapy were improved in patients with hydrogen-rich water compared to those with placebo. This study did not find differences in tumor response to radiotherapy as application of hydrogen-rich water . The application of hydrogen on radioprotection has been widely studied. Some investigators even proposed application hydrogen therapy in space flight . Definition of hydrogen as a kind of antioxidant seems cannot explain all radioprotective effects of hydrogen. But people have not found any other mechanism to replace the reduction of ∙ OH by H2 . The exact mechanism and signaling pathway involved in the protection role of hydrogen in ionizing radiation injury need to be studied in the future. There were only a few researches explain molecular hydrogen exerted its effect not only as an antioxidant. Itoh et al. [78, 79] suggest that H2 may become a gaseous signalling molecule like nitric oxide (NO), carbon monoxide (CO) and hydrogen sulphide (H2S) for the first time. They showed that H2 suppressed FcɛRI-associated signal transduction and prevented degranulation of mast cell, but not through reducing the ∙ OH, and they also demonstrated that H2 inhibited lipopolysaccharide/interferon γ induced NO production through modulation of signal transduction in the macrophage. An assay of DNA microarrays in the livers detected 548 up-regulated and 695 down-regulated genes in rats after 4 weeks of drinking hydrogen-rich water, and those genes for oxidoreduction-related proteins were enriched in the up-regulated groups . However, at present there is no direct evidence could confirm hydrogen gas is a new signalling molecule, which may need further investigations. Researchers have always been hammering at looking for an ideal radioprotectant. The sulfhydryl compound amifostine, named WR-2721, which is the only radioprotectant registered for using in human, has shown good radioprotective effects . But it has many side effects limiting its clinical use such as hypertension, nausea, vomiting, and other side effects . Some nature antioxidants such as Vitamins, Flavonoids, etc. have fewer toxic effects but also with lower radioprotection. Therefore, an ideal radioprotectant should be effective with few side effects. To date, no radioprotectant can fulfill the criteria. H2 as a new class of radioprotective agent may give us more hope, although there are still lots of future research needs to be done. This work was supported by a grant from the National Natural Science Foundation of China (Grant No.81072241). Corresponding author: Liren Qian and Jianliang Shen, Department of Haematology, Navy General Hospital, Fucheng Road, Beijing, 100048, P.R. China, e-mail: qlr2007com (Liren Qian) and shenjianliangorg.cn (Jianliang Shen).